Mail Communicator is the ultimate automated Email Marketing software tool to send personalized email, newsletter, follow-up, create auto responders, manage subscribe and unsubscribe emails, mailing list management and email campaign statistic tracking. Designed to save you time and money this tool allows you to keep in touch and build stronger relationships with your customers with customizable emails and newsletters to build a more profitable online business. New features allow users to now send customized attachments with their emails such as invoices and flyers. With the built-in Email Reader function, you can check your mailbox contents before downloading the messages to your PC and also process messages automatically with Message Rules. 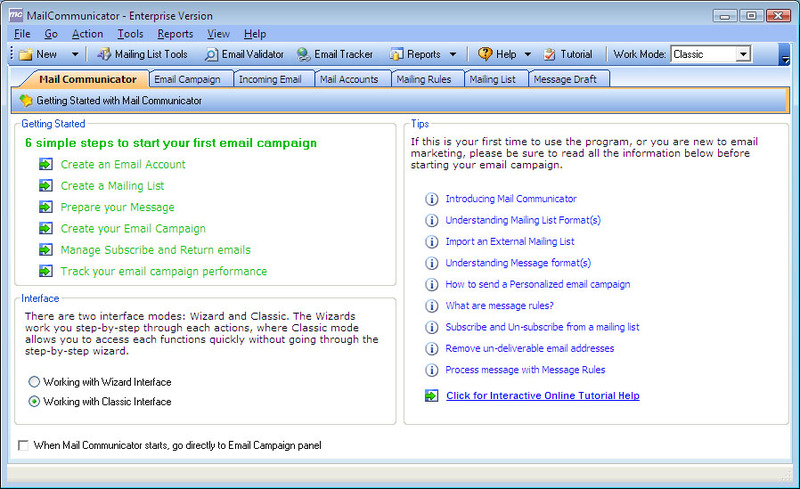 A powerful mailing list manager utility helps manage your mailing list easier. No other opt in email software on the market can beat its price/features ratio and the best thing is that you don't need any technical knowledge to start making use of its strong capabilities. You can easily start building profitable customer relationships today by executing effective, personalized and timely bulk email campaigns with this powerful all-in-one email marketing software.